We realize, that each website is different and requires custom modifications. The purpose of this section is to give you easy access to the information you need to modify your website's look. Our focus in on the client-side, that is we won't be talking about the administration panel's design. _lists.php - contains the list of functions responsible for displaying HTML code of elements of different kinds of lists, including list of subpages, images, widgets, etc. These functions are described in more detail in the later parts of this section. You want to change one element's looks, but you don't know what part of the code, CSS class or id is responsible for it? In your browser you can right-click on the chosen element and use the "Inspect element" function. 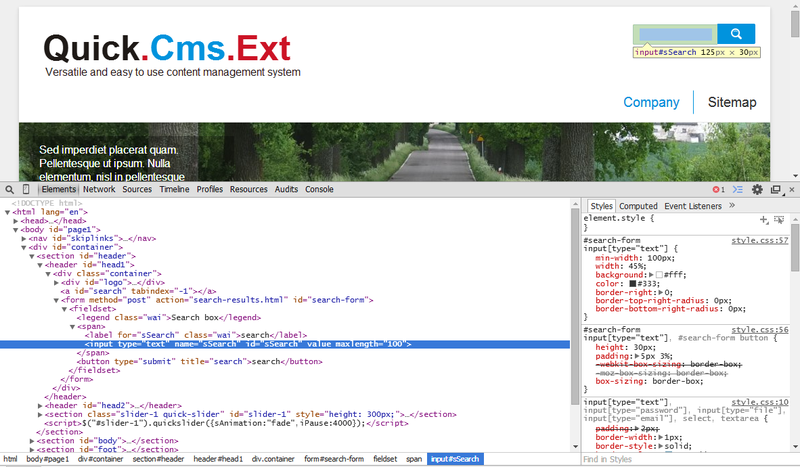 It allows you to see the HTML code and find the elements you're looking for. Now all you have to do is search for the name of the class or whatever you're looking for in the .css file, and you can modify the look of the element you chose. We strived to write the code in such a way, that modifying graphics would only require knowledge of CSS. So modifying the right code in a CSS file is in most cases all it takes. Register » if you don't have an account!